Table: 36 inches x 217 3/4 inches x 143 inches. Text: 6 inches x 188 inches. © Alfredo Jaar, courtesy Galerie Lelong, New York. A political system is all about the framework and defined methods of control. Political artists are all about breaking out of this control. By definition they are anti-system, anti-method, anti-participation, and in a word bold. I’ve always admired the urgency of some truly political artists, whose work demands attention given their personal history with a given politic that they are anxious to break down. One of my favorites was León Ferrari – the Argentine artists sadly passed away last week, but his legacy will hopefully be ripe for investigation by practicing artists and those interested in debunking systems. I was initially attracted to his works on paper, a series of drawings called “Letter to a General”. 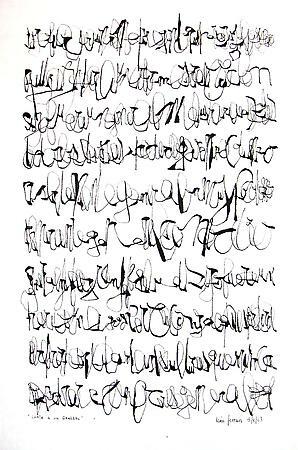 These gorgeous abstract drawings were his attempt at muffled writing – making gestures that look like letters but only coming out with marks and no meaning. They suggested that the people of Argentina had so much to say to their government, though their fear muffled their voices – hence the incomprehensible text. This idea resonated on a personal as well as political level – the idea of having urgent things to say but fear getting in the way distorts one’s voice. Fear is the ultimate distortion. León was so politically engaged and involved that even his son Ariel was abducted by the military and presumed dead. What artists now have this sense of urgency, this sense of emergency? 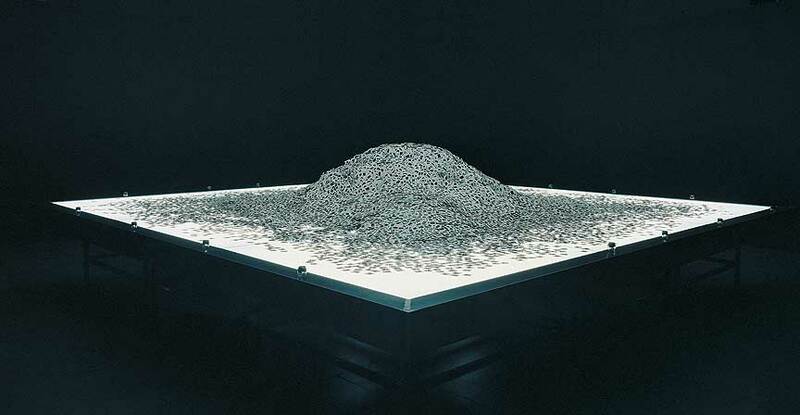 Alfredo Jaar has done some beautiful and most definitely political work, such as his heart wrenching 1997 piece, “The Silence of Nduwayezu”. “When Faith Moves Mountains” by Francis Alÿs and Marina Abramović’s “Balkan Baroque” also come to mind as powerful political work. In all of these artists’ work their egos are lost in order to highlight the thing which is bigger – the work speaks about larger issues in the most exquisite way. I am hopeful with this trend toward eliminating the ego in a work of art, it is a long time coming and dovetails beautifully with a reemergence of the spiritual in art. Not gods and monsters, but the present and the perfect in all of it’s imperfection. At Documenta (13) last year there were a lot of works tending toward removal of ego for a larger cause. Multidisciplinary artists were chosen whose messages and lines of inquiry were incredibly global, very urgent and political. Artists Omer Fast, Amar Kanwar and Michael Rakowitz were especially powerful commentaries on disintegrating systems and those that should be disintegrated. 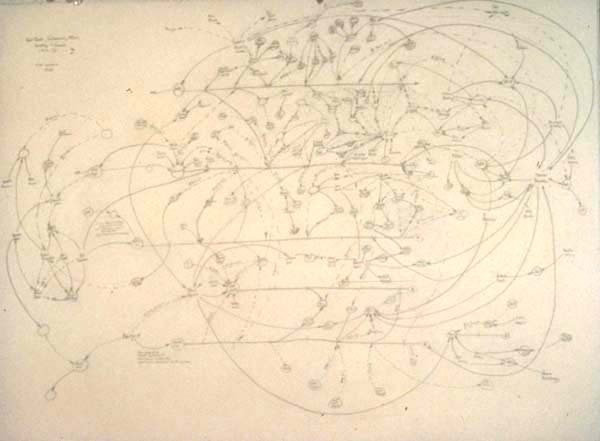 In particular at Documenta (13), with respect to debunking systems, there was the eery presentation of Mark Lombardi’s work who tracked, mapped and charted the webs of corruption connecting politics and big business between 1972-91 and 1996-2000. He dedicated his art practice to these narrative structures, only to have his research and life end through “suicide”. This tragic ending of his life only leaves people wondering if he might have unraveled too much of a system for some persons’ comfort. In his refusal to prescribe to a system of understanding, perhaps he left himself vulnerable to politically minded individuals. Or more eloquent that same year was a refusal by Jean-Paul Sartre to accept the Nobel Peace Prize. Sartre was a very political artist, and was even a prisoner of war. Making his refusal the most transparent. Can you imagine? The boldness gives me goosebumps. While I scurry around writing grant applications and seeking any form of attention I can garner on my work, these gestures of refusal and solidarity are incredibly touching. Currently western artists’ political system to debunk is capitalism – so the most urgent gestures seem to be to live off the grid, refuse to participate in social media, discontinue use of gas or simply escape by moving. Or make art about all of the above and sell it at a gallery. And what is with the veneer of the political with social art, participatory art or social engagement art nowadays? There are even awards now given to artists who claim their work to inspire social change. I have a very healthy cynicism about this type of art, the new monikers of social change and social engagement art are simply recycled terms from the 60s where they were then known as happenings and performance art. If any readers know of some contemporary off-the grid artists with a focus on debunking a system or two, please send me names – I’m curious and would love to support them someway/somehow. Oh and if you do know of an artist actually making social change, please forward too. I’m sure they exist, I just think they are usually teachers or some form of teachers, not simply artists. In fact most of the heavy lifting going on in perception changing in schools in particular are done by teaching artists. I remain cautiously optimistic, though I just supported artist Hank Willis Thomas’s Question Bridge Project – while I have yet to see the system debunked, I have hope. Who Cares, published by Creative Time books. “Anyone familiar with my work from the early Sixties on knows that I believe in art’s social presence–as breaker of official silences, as voice for those whose voices are disregarded, and as a human birthright. In my lifetime I have seen the space for the arts opened by movements for social justice, the power of art to break despair. Over the past two decades I have witnessed the increasingly brutal impact of racial and economic injustice in our country. “There is no simple formula for the relationship of art to justice. But I do know that art–in my own case the art of poetry–means nothing if it simply decorates the dinner table of power which holds it hostage. The radical disparities of wealth and power in America are widening at a devastating rate. A President cannot meaningfully honor certain token artists while the people at large are so dishonored. I know you have been engaged in a serious and disheartening struggle to save government funding for the arts, against those whose fear and suspicion of art is nakedly repressive. In the end, I don’t think we can separate art from overall human dignity and hope. My concern for my country is inextricable from my concerns as an artist. I could not participate in a ritual which would feel so hypocritical to me.